The Reverend Dr. Tom G. Aikman was pastor of the First Presbyterian Church of Pleasant Valley from 1972-1988. 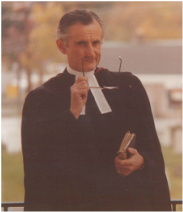 He retired to his native Scotland in 1988 and became our Pastor Emeritus. Sadly, Tom went home to his Lord and Savior in January of 2013. Tom Aikman was a learned man, whose sermons always captured our interest. There were full of quotes and biblical references, inspiring us to think and search our hearts. He spoke only as long as he felt it necessary to get his point across, often teetering precariously at the edge of the top step with only a book or bible in hand. His vocal inflections could be gentle of fiery, as the need arose. Tom’s children’s sermons were tailored to their young age. His most memorable talk was the year he introduced Mr. Robin, who was heralding the arrival of spring and the new life of the Easter season. Mr. Robin came back every spring thereafter, bringing his cheerful and hopeful message to our children. Tom was always mindful of the needs of his congregation. When he suspected that one of our families might be having trouble with their child’s college costs, he suggested that their yearly pledge to the church could be cut back. They decided against such a move, but were always thankful for his consideration. Tom had the courage to confront local cult leaders when they ensnared one of our members, and he vigorously attacked the new school policy which encouraged sports and music activities on Sunday mornings. On the other hand, he was not judgmental when it came to church attendance. One member shared the fact that her Dad, who did not attend church, was very fond of Tom; he appreciated a man like himself, who had love for all creatures and wasn’t afraid to “celebrate” with him on special occasions. Tom grew up on a farm in Scotland and never lost his interest in agriculture. He was always willing to help out in the field or in the hay mow. During one of our annual choir picnics, Tom noticed a new-born calf in the field. With no regard to this Sunday clothes, he carried the 75 pound calf to the safety of the barn, some two hundred yards away. 1. Neither of you is perfect, so you must look at each other with forgiving eyes. 2. Be faithful to each other, in word and deed. 3. Keep your individuality, even as you are joined together as man and wife. 4. Help your marriage to thrive through your continued involvement with church. All things are easier with God in your life. Tom’s favorable views on marriage were undoubtedly fostered by his 50-year marriage to his loving wife, Eiluned. Another favorite ministerial duty was performing baptisms. In 1982 he baptized his first set of twins, an exciting experience for him; all parties behaved admirably. In 1988, just before he retired, he baptized the babies from five different families during the same service. That was a memorable day. Tom was interested in community involvement as well. He was the long-time chaplain of the local fire company, and he was much sought after as a speaker at various group meetings. He was a virtual encyclopedia of information on Scottish history, an admirer of the Royal Family (most of them) and an expert on his beloved Robert Burns. Rev. Aikman - Remembered Well and Fondly from my days in PV and my associations with the 1st Presbyterian Church there during Rev. Tom's ministry - At times my children may have found his accent somewhat difficult for them but I am sure at least one of them also remembers Rev. Tom well & his childrens' sermons. A Fine Legacy - a life well lived - doing justice, loving kindness and walking humbly - all that is required. Bless You Tom - for all you gave so many. After all his years in America, Tom never lost his Scottish accent. The Psalms became the Sams, and Palm Sunday was Pam Sunday. There was one hymn in which the word “palm” was rhymed with “lamb”. Many members of the congregation smiled to think that our minister must have been responsible for the rhyme scheme. It was a sad day for everyone when Tom and Eiluned boarded their place and flew back to Scotland. Memories of them both are still vivid and frequent. Our congregation was truly blessed. It must have been 20 years ago now, because John Smith had just been made leader of the Labour Party. The venue, so that you can picture the scene, was the drawing room of the Roman Camp to which we had all retired for coffee. By way of background, my parents, who were visiting together for the last time, as it transpired, held political which were (it’s fair to say) not shared by Uncle Tom. Indeed the roast lamb, which my father had sent back to the kitchens an hour earlier causing high dudgeon, was probably less pink than his politics. There took place in those seemingly serene surroundings what I can only describe as “a frank exchange of views” between Uncle Tom and my father – the like of which the well-heeled guests at the Roman Camp have never recovered from. For if there was one item that was completely non-negotiable for Uncle Tom, it was his politics! And the sight of the two retired clergymen going at it “hammer and tongues” at one another, both in clerical collars, was one that is ingrained in my memory. Of course, Auntie Eiluned and Uncle Tom had been in the USA at the time of The Falklands, when Ronald Reagan had taken a fair amount of persuading to see things in the same way as Margaret Thatcher, whom Tom and Eiluned were to meet at a garden party when they came back home – so it was never an argument my father was going to win! So let us remember – as we think about Uncle Tom – not the frail old man of the last year or so, but the man at his peak – whether it be wielding a pickaxe on his drive in Doune with Alistair, reciting chunks of Greek verse verbatim, or poetry from Robbie Burns, tub thumping the pulpit, or displaying true Christian kindness and great generosity of spirit to those in genuine distress and need. He was, quite simply, revered and adored by his congregations in America – something I saw for my own eyes when he took three weeks out of his diary to show me both America and the American way of life – and death. For he insisted that I attend not only a baseball match at Yankee Stadium, but a funeral in upstate New York. I also saw him preach – thoughtful, erudite, and flavoured with a touch of fire and brimstone. The Americans got their money’s worth. Quick to see the scholar in others, he was no slouch himself, as a degree at St. Andrews and a doctorate testify. An avid reader and writer, almost the last thing he read was the entire works of Thomas Hardy and John Buchan. He tried, unsuccessfully, to teach me the dates of the Kings and Queens of Scotland! He could recite Greek and Gaelic fluently, yet tell the funniest of stories and do the Telegraph crossword in twenty minutes flat, pipe in mouth and whisky tumbler in hand. And to relax (the word is a misnomer as far as he was concerned) he painted landscapes and seascapes with extraordinary skill, and that without any formal training. He was a leading light of the McLaren Society, and published a fascinating account of the life of John McLaren, known as the “Boss Gardnener” – the great visionary Superintendent of the Golden Gate Park in San Francisco, who, rather like its author, hailed from farming stock in Pethshire. His last work was a murder mystery thriller ending in a cliff-top criminal trial, which he asked me to proof-read for accuracy. It goes without saying that it was accurate to a fault. He was a leading light in Rotary both here and in the States, as well as in Burns’ Society, where he often gave the immortal memory. All of which is a long way from the 18-year-old fresh from Morrisons Academy and his father’s farm at Sheriff Muir, who said goodbye to his parents and Jimmy, his younger brother, on a station platform to take part in the D-Day Landings with 47 RM Commando. The dagger he took to the beches was always by his bed woe-betide any unwelcome visitors. Auntie Eiluned assures me it was never used in anger but we only have her word for that! As an aside, I could never draw him on his experiences in Normandy, but one day he asked me whether I could solve a riddle that had clearly plagued him for 60 years. He had obviously tended to a wounded soldier on the beaches and knew him to be a lad from Birmingham called “Royale.” Armed with the name, I was able to contact the Royal Marine Association in Lympstone and tell him that the man had survived the beaches and was living in the outskirts of Birmingham. All I got was a brief thank you, and we moved on, but he had plainly found inner peace and was able to close that chapter. So, on any view, (and I don’t pretend to do justice to it in five minutes) a life lived to the full – often at breakneck speed – but always with Christian humility to the fore. But the last word, and thoughts, must be for my dear Aunt Eiluned. He and she had been inseparable and devoted to one another for half a century. Since they met in Newcastle, he a young and upcoming Minister, she the daughter of another Minister (my grandfather) held in high esteem at a nearby parish. I have often thought how it can’t have been easy “taking out” the only daughter of “the senior man” – but I like to think it was the wisest move he ever made. Well, Uncle Tom, it’s time to enjoy your pension.